New York: Doubleday Press, 1987. First edition, signed Limited edition. Octavo, original blue leather, all edges gilt. One of 250 numbered copies, signed by George Bush. Fine in a fine slipcase. In this autobiography, written by a Vice President while still in office, George Bush looks at his previous career, from navy pilot in World War II to his financial success in the Texan oil fields in the 1950s. He then served three Republican presidents and survived encounters with Democratic Presidents Johnson and Carter. This book throws light on his years as congressman, UN Ambassador, Republican National Committee Chairman during Watergate, envoy to China and Director of the CIA. Bush also discusses the failings he believes led to the Iran-Contra affair. He offers anecdotal views on international figures - Reagan, Nixon, Kissinger, Mao, Gorbachev and Thatcher, and reveals the political issues he is championing for the presidency of the United States. Signed limited first edition of the 41st President of the United States’ memoir, published during his term as Vice-President. Octavo, original blue leather, all edges gilt. One of 250 numbered copies, signed by George Bush. Fine in a near fine slipcase. Signed limited edition of George W. Bush’s autobiography. Octavo, original cloth, original slipcase, illustrated. Signed by George W. Bush. Fine in a fine slipcase. Bush, George H.W. ; Justice William H. Rehnquist and Justice Sandra Day O'Connor. President George Bush, Chief Justice William H. Rehnquist and Associate Justice Sandra Day O’Connor Signed 1989 Inaugural Invitation. President George H.W. Bush, Chief Justice William H. Rehnquist and Associate Justice Sandra Day O’Connor Signed 1989 Inaugural Invitation. 8.5″ x 11″; Washington, D.C.; with First Day Cancellation stamp dated January 20, 1989. Invitation to the inauguration of George H.W. Bush and Dan Quayle. Signed by President George H.W. Bush, William H. Rehnquist and Sandra Day O’Connor. Justice Rehnquist swore in President Bush, and Justice O’Connor swore in the Vice President Quayle. Double matted and framed. The entire piece measures 15.5 inches by 13.5 inches. Bush, George; Edited by Jim McGrath. 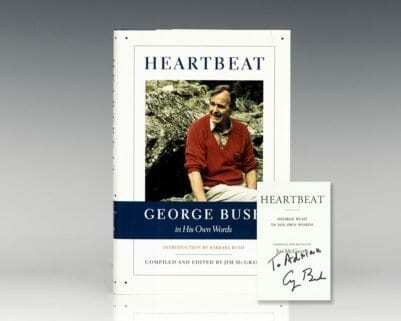 Heartbeat: George Bush In His Own Words. First edition of this collection of excerpts from President Bush’s speeches and other writings. Octavo, original half cloth. Fine in a near fine dust jacket. 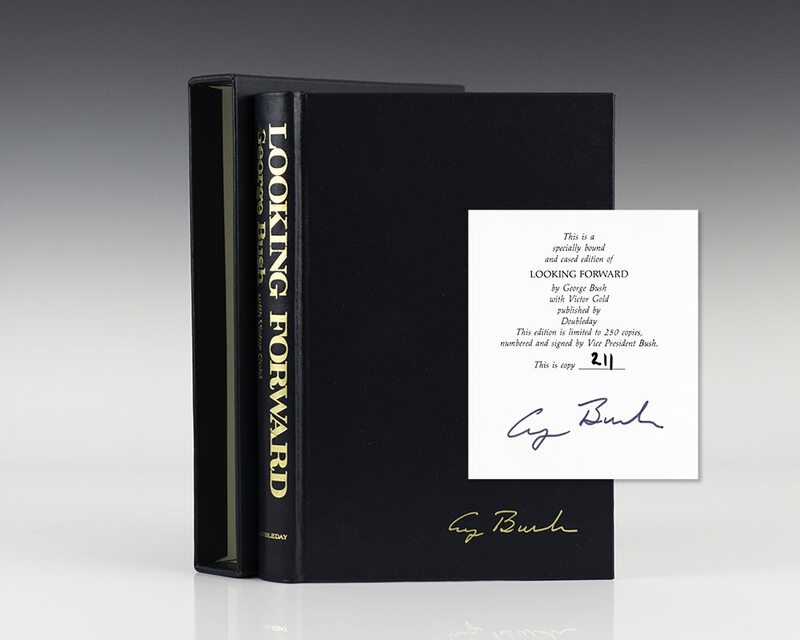 Inscribed by George Bush on the title page. Compiled and edited by Jim McGrath. Introduction by Barbara Bush. Bush, George Herbert Walker; George Valdez. George Herbert Walker Bush: A Photographic Profile. College Station, TX: Texas A & M University Press, 1997. First edition of this photographic profile of the 41st President of the United States. Quarto, original dark blue cloth. Signed by George H.W. Bush. One of 1250 copies. Fine in a fine slipcase.